The DIRECTV Residential Experience (DRE) is a revolutionary hotel TV system. Our customers tell us that this system allows you to give your guests the same TV experience they have at home including the full residential channel lineup for less money than the other options. Instead of limited channels for your guests and the high cost of headend systems or cable and Pro-Idiom TVs, when they installed the DIRECTV DRE our hotel customers received advanced technology, more control of the hotel tv system and easier maintenance with no upfront money, 100% financing and less installation headaches – at a lower price than cable. Now DIRECTV is delivering even more for you and your guests. The New Welcome Screen system for the DIRECTV Residential Experience will improve your communication with your guests, giving you a way to advertise events, restaurants and specials in your hotel. With interactive apps and up to 50 pages of locally inserted information along with Express Folio Checkout capability, it will enhance your guest’s experience and improve your staff’s efficiency. 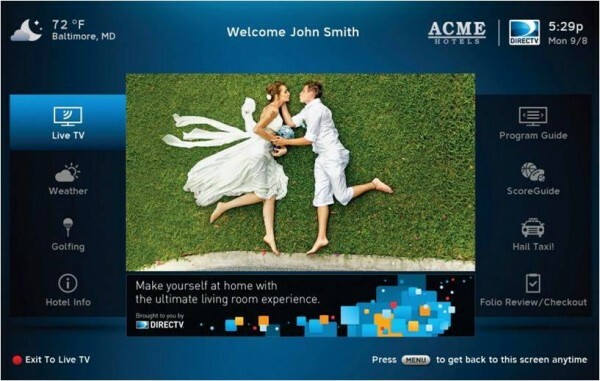 The new DIRECTV Hotel Welcome Screen will give your guests a more interactive in-room TV experience with info like…. The new DIRECTV Hotel Welcome Screen will save your staff time and save you money! Today the DIRECTV DRE Welcome Screen System offers up to 8 Apps and 50 pages of local information, but in the future new apps and features will be added. Since beta, 16 different apps have been added to the system! On Thursday at an invitation only event at the Versace Mansion Hotel in Miami, a major announcement is coming about some of those new features. Rumors are pay per view movies are coming soon. No matter what this huge announcement is on Thursday it is going to be groundbreaking, so stay tuned for more!